Gerald Donaldon?s authoritative 1989 book on Gilles Villeneuve ? The Life of the Legendary Racing Driver ? set a high standard for F1 driver biographies. But few drivers inspire the kind of affection Villeneuve does. Surely one of the most beloved Formula One drivers of all time, it therefore comes as no surprise to find new books on Villeneuve periodically appear. This recent offering from Hungarian author Karoly Mehes stands out because of the breadth of interview subjects he obtained. Seven world champions, many of Villeneuve?s other rivals, his mechanics and journalists he was close to all feature. Bernie Ecclestone even makes an appearance with an anecdote about trying to stop Villeneuve from bringing his caravan into the paddock and a complaint about how today?s drivers are lacking in character. Two points which I can?t help help but feel are not unrelated. But while there?s a rich vein of source material at the core of the book, its presentation leaves something to be desired. Each of the 44 brief chapters features a handful of questions and answers with each subject. Inevitably the same questions pop up more than once, and it quickly starts to feel very repetitive. So what we have here is a half-done job: a series of brief if often interesting Q-and-As with nothing to bind them together into a narrative. The sometimes patchy English translation is another unwelcome obstacle to the reader. 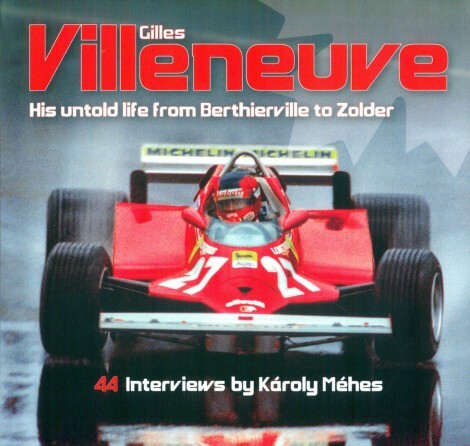 I?m sure Villeneuve fans with an appetite for something new about this heroic driver will appreciate the effort which has gone into the book and its treasure trove of anecdotes. But while it?s clear a lot of passion has gone into it, a bit more discipline was needed to turn it into a must-read book. Read all the F1 Fanatic book reviews.